It's not every day you can snag free Heebster swag. But this week, CoolJewBook.com and ModernTribe.com chose one lucky winner of the Cool Jew Gift Box. The winner was chosen based on the cool ways they celebrated Purim. * Cool Jew, a 2008 National Jewish Book Award Finalist. * Dreidel Hustler keychain doll, Heeb magazine’s Dreidel Hustler in 3D! 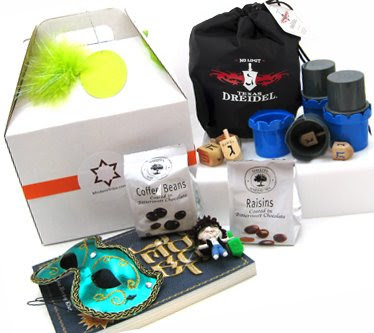 The winners of the Cool Jew Gift Box are Victoria and Ron Gindick of Valley of the Sun, Arizona. As part of their Purim festivities, the Gindicks used their solar oven to bake whole grain breads with fresh ground flour to ship overnight to their mishpocha in New York. Shabbat Shalom and mazal tov all around!